This is a little liangban 凉拌 I put together when I had limited ingredients in the house and little desire to run to the market. That sometimes is how I come up with some really nice dishes. As they say, necessity is the mother of invention. 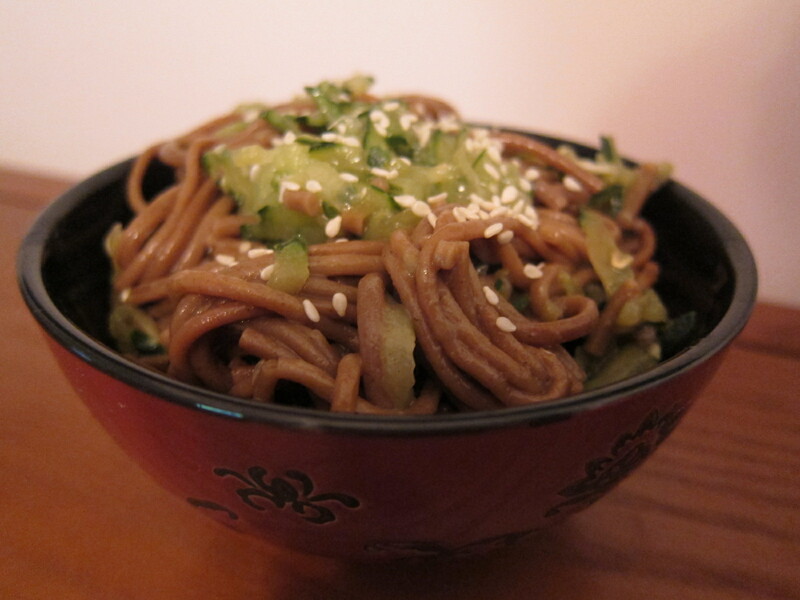 Cook buckwheat noodles in salted water. Drain and let cool. Combine all other ingredients except for sesame seeds in a bowl and stir until mixed. Add noodles and mix again. Taste and adjust seasonings. Top with sesame seeds. You can serve immediately, but you can also put this in the fridge for a while to both get it nice and cold, and to let the flavors blend better. If you do that, wait to put the sesame seeds on until just before serving. This makes a very nice vegan main dish, or a great side dish for summer.